The Bulls were led by D.J. Augustin and Kirk Hinrich with 16 points each, but they combined to shoot 10 of 31. But, in effect, that’s the way the Wizards played, led by Nene with 24 points and eight rebounds and Marcin Gortat with 15 points and 13 rebounds. The Wizards, in the first half with Gortat and in the second half with Nene, jammed Joakim Noah, playing him tight and physical and effectively limiting his playmaking that has become the trademark of the Bulls offense without Derrick Rose and Luol Deng. Noah had 10 points and 10 rebounds, but just four assists and had limited impact on the game. It looked for awhile like the Bulls would with a 64-51 lead early in the third quarter. The Bulls trailed 24-22 after the first quarter with Carlos Boozer off to a hot start and then led 54-48 at halftime with Augustin forcing contact for free throws and Taj Gibson aggressive on followups. But the Wizards’ plan was keeping the Bulls from their usual ball movement and just five first half assists. The Bulls then after Mike Dunleavy’s hot third quarter start to provide the 13-point lead had one of those one-shot-and-out cold spells; they also lost their cool a bit as several players began complaining about the lack of foul calls and dawdled a bit in transition, and the Wizards got back within a point with 3:32 left in the third quarter. Yes, it’s the playoffs. Man up; or something like that. This is especially when you miss someone like Rose; it’s someone the Bulls cannot replace. There’s a lot of good feeling about this Bulls team that got the fourth seed at 48-34 and came in a favorite over the Wizards. But a game like Sunday’s demonstrates vividly how much a team like the Bulls misses someone like Rose. When you have those scoring droughts or the defense tightens against you, for those five-minute stretches you need a player to make plays. That’s what the great ones do. Everyone talks about those last shots and the fourth quarter scoring of the stars. But what the stars do most is get a team through those rough patches when everything breaks down or fatigue sets in until a second wind. They’ll take over and score three or four baskets to hold off an opponent so the 19-7 over six minutes in the third quarter the Wizards had becomes maybe 19-15. And then you still have the cushion to get into the fourth quarter with the lead, have your players rested and ready for a strong finish. 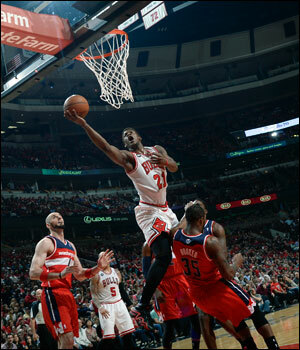 “I feel like the main thing we did not do was rebound,” said Jimmy Butler, who had a strong all around game with 15 points, seven rebounds and three steals. 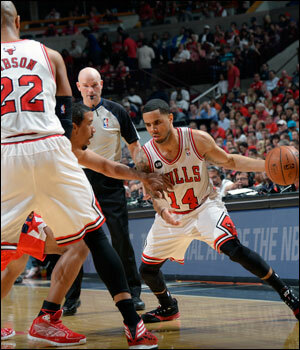 Instead, the Bulls went into the fourth quarter leading 75-72 with, effectively, no cushion. And while the Bulls have become a better fourth quarter scoring team, they still don’t have that go-to type player to finish a game. The Wizards with Nene continued to play up and physical with Noah. Noah did have one nice pass for a Jimmy Butler dunk that made it 79-74 Bulls with 9:16 remaining. But indicative was that Noah had to go about four feet past the three-point line to make the pass. For the most part, the Bulls can’t operate an offense with Noah that far from the basket. Also, give the Wizards credit as they were the better defensive team. Though John Wall and Bradley Beal were a combined seven-of-25 shooting and Wall admitted to reporters afterward he was so nervous at times he couldn’t breathe in his first playoff game, the athletic Wizards were active on defense. They closed fast to the three-point line, running the Bulls off those shots and giving the Bulls few open looks. They understood the Bulls aren’t a team with players to put the ball down and drive it. Plus, they usually had Nene or Gortat to protect the rim. It’s why the Bulls had just 13 assists, one of their lowest totals of the season for a team that averages almost 23 per game. The fewest the Bulls had in a game this season was 11 and the Bulls haven’t won this season when getting 13 assists or fewer. By Washington pressing Noah and closing out on the shooters so well, the Bulls were forced to put the ball on the floor and make plays, which is not a specialty. They may need to force the ball inside more. Actually, Wizards coach Randy Wittman made a nice move staying long in the fourth quarter with veteran Andre Miller. Miller isn’t one to go for Augustin’s many shot and pump fakes like the young athletes do, instead staying down, which limits the smaller Augustin. Plus, the Wizards did what the Bulls feared, constantly going at the smaller Augustin. It was sort of baiting a trap. As the Bulls went to help off the screens, the big men rolled and then as the Bulls collapsed the Wizards fanned out passes for open shots. And even when the Wizards were missing, Gortat or Nene was in position for second shots. Nene made a terrific play in staying close to Noah and stripping the ball and racing all the way for a layup to bring the Wizards within one with eight minutes left. And then Nene and Miller working two-man games continued to cut up the Bulls. The Wizards would not bring Wall back until 4:33 was left with the game tied at 87. The Wizards were kings this time. Hinrich and the Bulls will host Game 2 at 8:30 p.m. CT at the United Center. The Wizards then broke from an 88-88 tie with 3:43 left with a Trevor Ariza backcut and pass off to Gortat for a layup. The Bulls couldn’t get any good looks with the Wizards closing fast and Noah mostly out of the offense. Hinrich and Gibson missed jumpers and then Nene made a 16 footer for a 92-88 lead with 2:40 left. Noah scored on a big offensive rebound off an Augustin miss. But Gortat got inside again for another rebound as Gibson went to help in forcing the pick and roll to the baseline, which is the right defense. But Noah had to hold off Nene and there wasn’t enough help with the Bulls playing two point guards. It’s a question going forward whether the Bulls will go for more size or scoring in the fourth quarter with Dunleavy or Carlos Boozer. The Bulls have pretty much played the last month with Hinrich, Augustin, Jimmy Butler, Noah and Gibson in the fourth quarter. 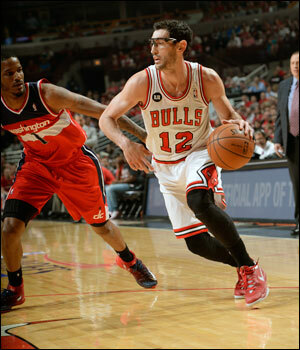 But the Wizards were exploiting that lineup and outrebounded the Bulls 13-6 in the fourth quarter. Gortat made two free throws for a 94-90 Wizards lead with 1:51 left. Hinrich then missed a quick three on top, but Beal missed an open baseline shot. Hinrich then got stuck with a baseline jumper with the shot clock expiring as the Wizards closeouts ran three Bulls off jumpers. Washington’s defense was much more active. And it was a philosophical Nene afterward who wasn’t exactly talking about a Wizards’ resurrection. But he invoked the thrill of playing on Easter Sunday. Nene is Portuguese for baby in an endearment way. He hardly endeared himself to Chicago. Count the Bulls at least a little stunned Sunday. Wall then shot an airball. Again Gibson came off to help the screen being pushed baseline. But with Noah trying to hold off the physical Nene, a guard from the weak side had to box out. But that was Augustin, and Gortat went right over him for the offensive rebound and put back for a 96-90 Washington lead with 34.2 seconds left. Though the Bulls point guards were hardly in position to make that play. Gibson then lost the ball trying to get to the basket and threw up a wild shot that missed and Hinrich fouled Beal while Bulls players continued to complain to the officials and began to walk back on defense. That’s uncharasteric of this Bulls team and certain to be addressed by Thibodeau in what could be a very uncomfortable film session at practice Monday. “If we think a call isn’t going our way, you can’t allow that to take away from getting back and playing great defense,” said Thibodeau. 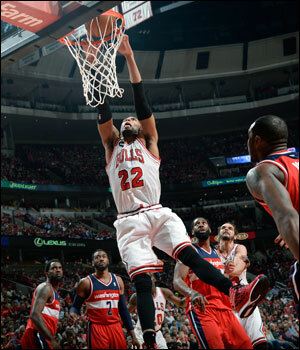 The Wizards made free throws to walk away with the victory with Game 2 in the United Center 8:30 p.m. Tuesday. While it’s the Bulls who will be sleepless in Deerfield.